As a Physical Therapist, I often work with patient who need a temporary wheelchair ramp after surgery. In some cases, a more permanent wheelchair ramp is needed, but the overall goal is the same: improved independence. Safety. Ease of Use. Affordability. Of course, identifying the location of the wheelchair ramp will also determine the type of ramp you’ll need. Steps into Home – Wheelchair ramps for steps are commonly used with outdoor steps to a porch or within a garage. The length of your ramp depends on how high of a rise your steps span. See below for the wheelchair ramp slope recommendations based on the ADA wheelchair ramp guidelines. Threshold Ramp – Wheelchair ramps for thresholds are usually easy to install and take very little space. Highly recommended for older homes. Vehicle Ramp – The wheelchair ramp grade recommendations apply for a vehicle too, so entry into a vehicle 2 feet from the ground requires a 12’ ramp. What does this mean? A 1 inch high step needs a 12 inch long ramp. A 1 foot high step will need 12 feet of ramp. Wheelchair Width: The minimum clear width for single wheelchair passage shall be 32 inches. Max Grade for Wheelchair Ramp: The ramp slope maximum is a 1:12 ratio: 12 inches of ramp for each inch of rise. Let’s say you have two steps that total 12 inches in height. Using the 1:12 ratio, you’ll need 12 feet of ramp to cover the 1 foot rise in total height for the two steps. For a single 6 inch step, a 6 foot ramp is recommended and so on. Basically for every inch of rise you have, the ADA recommends one foot of ramp length. If affordability and stability are high on your priority list, then an aluminum wheelchair ramp should be a top consideration for choosing a ramp. Not only are aluminum wheelchair ramps relatively lightweight, they’re sturdy, movable, and easy to install. You can always do a search for used wheelchair ramps, but I recommend looking at the price of new ramps to compare. If the difference is small, you’re better off with a brand new ramp that you know is solid and safe. Here are the top aluminum ramps based on consumer reviews and ratings on Amazon. SAFE, LIGHT, AND PORTABLE: Includes safety pins and a built-in carrying handle. The ramp weighs only 16 pounds making it easily portable. If you don’t plan on moving the ramps from a location, my recommendation is to look for a solid ramp. Solid ramps are usually placed at entryways or in areas of your home like a single step entry to a lower level. Folding ramps can be used in multiple settings but are generally larger, heavier and require some setup to lock in place. 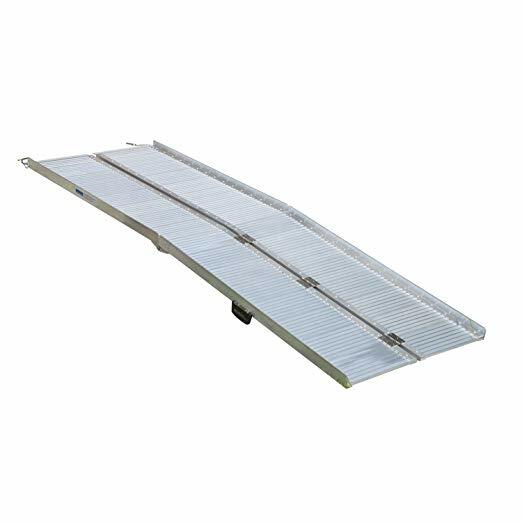 If you simply need one or two feet of ramp, a solid ramp will be easy to position and maneuver. For 2 to 3 small steps, a foot folding ramp is convenient, affordable, and simple to set up. If you have 2 to 3 standard steps (6” to 7” height each) to get into your home, you should consider a solid ramp or have one professionally installed. When someone needs to use a wheelchair after an injury or surgery, a portable wheelchair ramp is a great option. 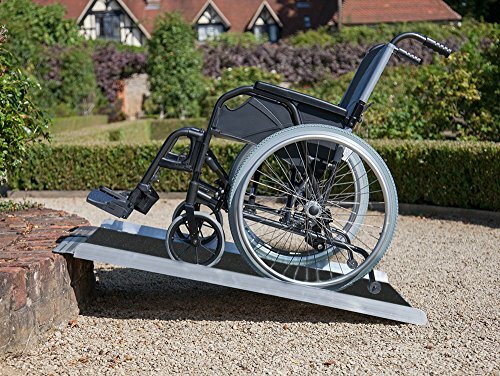 Most portable ramps are made from aluminum which makes them lighter and easier to carry or move within the home. 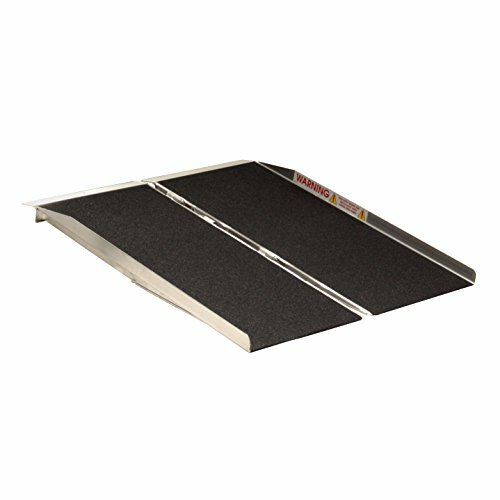 Another benefit of a portable ramp is that you can purchase one ramp and use it in multiple areas of the home. Of course, this requires that you have someone else to help you as moving a portable wheelchair ramp is not recommended if you’re using the wheelchair yourself! With most portable wheelchair ramps, you can use them outdoors, but you may not want to keep it outside for long periods of time. The change in weather can cause corrosion, so if you plan to use a ramp for a long time, you’re better off getting a permanent wheelchair ramp installed. Not surprisingly, you can find wheelchair ramps at Walmart. Home improvement stores like Lowes and Home Depot have wheelchair ramps available online as well. Most of the time you have to order the ramps from the website and have them delivered to your home or to the store for pickup. Personally, I recommend that my patients look through the reviews on Amazon because you can find the same wheelchair ramps with plenty of user reviews and images.